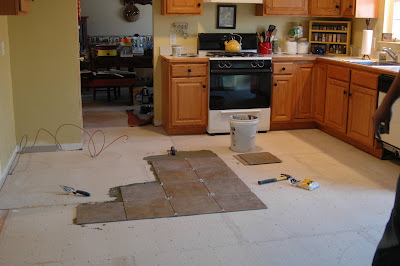 Pretty Purplexing: I'm getting a new KITCHEN! Well, not quite an entirely new kitchen. We are having a new floor installed. But ~ hey! ~ it will make a world of difference. Tile is so much prettier than the ugly linoleum that I had. Anthony (who is the brother of my friend Joette) is installing it for us. Yesterday he put in the hardibacker and today he is working on the tiles. 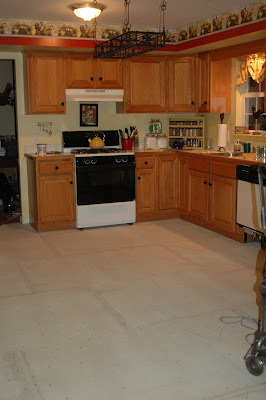 We took out the island and one cabinet, which makes the kitchen look so much bigger. 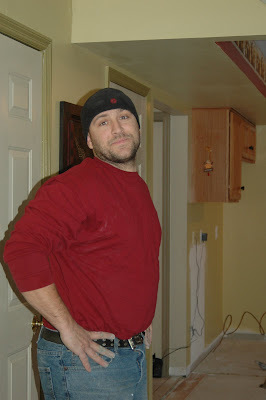 Todd and I are going to look for a newer island, possibly this weekend, depending on our hockey and lacrosse schedule. Love the tile, can't wait to see pictures of finished product. Congrats! I can understand why you're so excited! Can't wait to see the new floor! Your kitchen will look great, the better to feed all those boys with!